Two people have been taken into police custody for their alleged involvement in the murder of two youths in Labasa over the weekend. A woman and a man who were taken in last night are alleged to be involved in the murder of best friends Samuel Vikash Nand, 17, of Dreketi and Abhishek Kumar, 20, of Tuatua in Labasa, whose bodies were found at Korosomo Hill in Tabia Labasa. According to the post mortem report, both died as a direct result of injuries sustained by them. 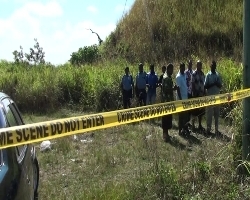 The bodies were found by Tabia farmer, Aporosa Daunivalu, 44, at the incident scene which is approximately 50 metres away from the Labasa Nabouwalu highway. The scene, locally known as Long Bay is a famous drinking spot to locals. They were reported missing by family members after they failed to return home on Friday night. The families of the two boys each own a shop at Dreketi. 3 Responses to "Labasa murders: A woman and a man in police custody"
the killerzshud b punished wel. THEY SHOULD BE HANGED TIL DEATH.